← Divine image or pareidolia? Among views of Genesis 1 held by Reformed thinkers, the Framework view has attracted much positive interest over the past hundred years or so. It is not, however, a novel view, as we shall see. The basic idea is that the week of Genesis 1 is a “literary framework”. Its highly artful, complex, quasi-poetic form shows that it isn’t a simple historical narrative; no one would communicate such a narrative in such a form. It is an “exalted prose hymn”. The material of the prose-hymn is arranged into the shape of a week, but it portrays God’s creative activity in a topical or thematic way rather than strictly chronologically. E.g. days 1-3 form a perfect parallel with days 4-6, the text “revisiting” the first three days in its account of the second three. How much time the creation week took (whether short or long) in real “calendar time” is not addressed by the prose-hymn. Augustine, arguably the most brilliant and influential of the early church fathers, and first great defender of the doctrines of grace, is the fountainhead of the “Framework” view. He teaches his version of it in his Confessions and his commentary on Genesis. Some form of the Framework view is found among the great Augustinian theologians of the Middle Ages, e.g. Anselm of Canterbury and Thomas Aquinas. It has been accepted and defended among modern thinkers by (for example) W.H.Griffith Thomas, N.H.Ridderbos, Meredith Kline, Lee Irons, Henri Blocher, Bruce Waltke, Tremper Longman III, Gordon Wenham, John Walton, and J.I.Packer. A variant is offered by notable Reformed Old Testament scholar and Intelligent Design thinker, C. John Collins, whose recent commentary on Gen.1-4 offers a lucid exposition. The illustrious Hugh Miller (1802-56) held a view somewhere between the Day-Age view and Framework view: he thought the days of Gen.1 were not “days of creation” but “days of revelation”, in which visions were given to Moses regarding different aspects of God’s creative activities. However, Miller also held that each visionary day referred to long ages of geological time. In this two-part essay, I offer a summary of arguments in favour of the Framework view. The bottom line is that the nature of the language in Genesis 1 tells strongly against the view that it is a straightforward historical account. Quite simply, a straightforward historical account would not be written as Genesis 1 is written. The style and genre are not that of historical prose. 10 times we have the formula “God said”. ►Of these 10 uses of this formula, 7 relate to the non-human creation, 3 to humanity. ►Of these 10 uses of this formula, 7 relate to the terrestrial world, 3 to the heavens. 10 times the verb “to make” is used. 10 times the formula “according to its kind” appears. The verb “to create” appears at 3 points in the story. ►The third time it appears in a threefold repetition. ►7 times there is added to this formula a further statement about God naming or blessing. The word “earth” occurs 3 x 7 times. 7 days encompass the whole account. This artful numerical complexity is manifestly not how a simple, matter-of-fact prose narrative would be written. Genesis 1 is something else. Another indication that Genesis 1 is not a straightforward historical account is the fact that it “is written in exalted, semi-poetical language” (E.J.Young). Many interpreters discern in the account a hymn-like flavour. It is pitched somewhere between poetry and prose: an “exalted prose-hymn”. Its use of repetitions, some alliterations, and majestic style, all point in this direction. The end result has been described as “a strophic hymn in prose or a hymn which is a unique blend of prose and poetry” (Claus Westermann). Again we must ask, is this how the author would have written a plain, matter-of-fact historical narrative? So the text uses the word “day” in Genesis 1 to describe each of the six segments of the creation week, and then immediately afterwards in Genesis 2, it uses the same word “day” in the singular to describe the entire process of creation. Whatever the “days” of Genesis 1 are, they’re all compressed into one single day in Gen.2:4. This is a clue that we shouldn’t take Genesis 1 as a literal, historical description of 24-hour days in clock-time: the one day of Gen.2:4 embraces all six creation days of Genesis 1. Conclusion: this reveals that the text is using the word “day” rather more flexibly than the literal 24-hour interpretation allows. It therefore makes more sense to understand the creation week as a figurative week. And God said, Let there be lights in the expanse of the heavens to separate the day from the night. And let them be for signs and for seasons, and for days and years. This is the only undeniable mention in the Genesis text of 24-hour calendar days. Now… If it was only on the fourth creation-day that 24-hour calendar days were established by God, how can all the creation-days be 24-hour calendar days? What about the first three, prior to the establishment of 24-hour calendar days on creation-day 4? Can the writer really intend us to understand his description of the creation-days as real-time calendar days, when he himself defers the origin of such days until his account of day 4? Again, therefore, it makes better sense to understand the creation week figuratively. The work of God as the Creator-Craftsman in Genesis 1 is presented in very human terms, which (on the face of it) shouldn’t be understood literally. On the six creation-days, God is always and only described as working during the hours of daylight. Then we have the “evening and morning” formula. Unfortunately, the formula has been poorly translated in the Authorised Version as “and the evening and the morning were the first (or second, etc.) day”. A more accurate translation of the Hebrew is “and there was evening and there was morning, day one (or day two, etc.)”. The AV translation wrongly makes it sound as though the text is defining the day as being made up of one evening plus one morning. However, let’s take the more accurate translation: “and there was evening and there was morning, day one (or day two, etc.)”. Coming regularly at the close of each creation-day, this formula signifies the end of daylight, the fall of night, and then finally the end of night as the daytime once again dawns. God is never portrayed as working in the night-time period. You make darkness, and it is night, in which all the beasts of the forest creep about. The young lions roar after their prey, and seek their food from God. When the sun rises, they gather together and lie down in their dens. Man goes out to his work and to his labour until the evening. Here the night-time belongs to the beasts of the forest. Man works during the daytime, but stops when evening falls. This is exactly how God is presented in His work-days of Genesis 1. 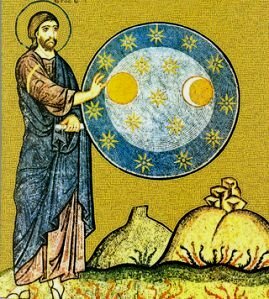 He labours as a “cosmic craftsman” during the daytime, then stops at evening, and then resumes His work the next morning. This depiction of God surely makes the best sense when we understand it as figurative. The text is deliberately describing God in human terms, as though He were a working man who laboured in the daylight hours and then retired at night. We know, however, that God has no need of daylight to work, and no need of rest periods at night. God’s creative work is being presented in human form, in terms of a similarity to human work-and-rest periods in the daylight and the darkness. If we see figurative language here, in this rhythm of work and rest, then there is good reason to see the days themselves as belonging to a figurative week. 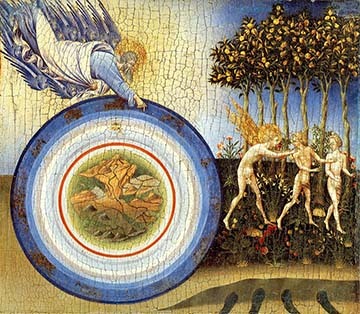 The text is using the human day as a method of portraying God’s work-activities in creation. In that case, we have no way of knowing from the text how long “God’s work-week” lasted in terms of historical calendar-time. Summing up: the text is using the human work-week, and man’s cycle of work and rest during daylight and darkness, as a way of depicting God’s creative activity. Taking this picture a whole, we have no reason for thinking that the creative activities of the Divine Worker must have lasted only a literal week in human calendar-time, any more than we would insist that God is in reality a working man who works during the daylight hours and retires at evening for rest. The seventh day – God’s sabbath – has no end. Each of the six creation-days ends with “and it was evening, and it was morning,” followed by a numbered reference to the day. The formula “and it was evening, and it was morning” gives the ending of the day. The seventh day, however, lacks this formula, and therefore has no described ending. This indicates that God’s sabbath day of rest is ongoing – it isn’t confined within the space of a 24-hour day. So whereas the seventh day of the human calendar week is blessed as a memorial of God’s sabbath rest, the divine sabbath itself can’t be restricted to the 24 hours of a human calendar-day. First, who would maintain that God’s sabbath rest lasted only 24 hours? If God’s sabbath day lasted only 24 hours, it must have ended at the end of that day; and then He would have resumed His creative work on the eighth day. But we know that creation was finished on the sixth day. God did not resume His creative work on the eighth day. God will create again only at the new creation (which the early church fathers for that very reason called “the eighth day”). We still await the new creation. Therefore God’s sabbath “day” of rest has continued beyond a mere 24-hour period or indeed any human time period; it endures throughout the whole time leading up to the Second Coming. We are still in God’s seventh day right now. Second, Psalm 95 and Hebrews 4 teach that God’s sabbath rest is a present reality. The believer is invited to share in this rest right now. Therefore God’s sabbath has not ended, and therefore His “day seven” is ongoing – obviously longer than 24 hours, since more than 24 hours have elapsed since the creation of Adam! For this reason the Jews persecuted Jesus, and sought to kill Him, because He had done these things on the Sabbath. But Jesus answered them, My Father has been working until now, and I have been working. Jesus vindicates His work of healing on the human sabbath by appealing to the fact that His heavenly Father, despite His divine sabbath rest, “has been working until now”. The Father works on His sabbath in His gracious works of providence towards humanity. Therefore His Son may imitate Him, and do gracious works for people on the human sabbath day. Jesus’ argument here about the Father’s continual work on His sabbath “until now” only makes sense if we accept the Father’s sabbath “day” of rest as a continuous period, from the end of the sixth creation-day right up to the present. Conclusion: God’s seventh-day sabbath in Genesis 1 isn’t a 24-hour day, but a period of time extending from the close of His creative activity right up to the present. If so, the creation week cannot be a literal week in calendar-time. It is again better, therefore, to take the week in a figurative sense. Welcome back, Penman! A nice overview to get us thinking (especially any YECs who may drop by). As ever, the historical background – long predating any debate on evolution – helps to set your agenda. Many thanks. The framework is really what one might call a “meta-theory”, it seems to me – it suggests the account is literary rather than literal, but leaves a number of options open for interpretation. For example, my own liking for John H Walton’s view, which (a) emphasises the functional rather than the material aspect of creation and (b) sees it as a cosmic temple inauguration text, can fit nicely into the Framework hypothesis. Walton himself, I think, prefers a “literal” 7 days – days in which God organises the existing cosmos towards man’s role in the world. But that, though it defuses the whole Science’s account v Biblical account nonsense, is subject to just the same considerations that Augustine introduced, eg why 7 days rather than instantly? I guess there is no real contradiction if one sees the framework not as merely literary or “symbolic” in the modern materialistically loaded sense, but as representational of a real work of God expressed analogically to enrich its meaning. As so often in the Bible, the sign is the thing itself – so the language in Genesis doesn’t just suggest that the author wanted to write poetry rather than scientific formulae, but that creation itself is as much, or more, a poem than a mere job of work. One could even say that the integral symbolic numbers represent the hidden mathematical order of the world to a pre-Pythagorean people. You’re the expert on John Walton and I may have misapprehended his view. Since he argues that what God is doing on the six “days” is assigning functions, not materially creating, he could indeed take the six days as six successive 24-hour days. On the other hand, I imagine one could also hold that the Genesis week is describing functional assignments within a Framework view which remains agnostic about the clock-time-length of the week. John Lennox, I believe, also wishes to retain the literal nature of the days but within a “geological week” – i.e. geological deep time punctuated by 24-hour days of creative activity. This is an interesting approach to understanding Genesis 1, and is of considerable help in moving away from the nonsensical debates about time that God supposedly took in creating and I commend the author. I want to add a couple of points. I think that meaning is rich in Genesis, but for us to access the full richness, we would need to be fully knowledgeable of the language of the author – consequently I will always feel that the translation(s) will mean I will not fully appreciated this magnificent account, and am drawn to the notion of a hymn (or act of worship) in this. The second point is that all meaning in the Bible, eventually is provided to us by God for our benefit and well being – I see this as a additional level regarding the six-day working week. Even now, I am astonished at how far-sighted it seems, as we see materialists decide to work without seeking a time for reflection and a fuller understanding of their life, and the community; as they often bemoan a loss of value with the accumulation of material wealth, they nonetheless ignore the universal message in Genesis. I echo Jon’s thanks for this excellent summary, Penman. GD, those are good points regarding how farsighted and I would add “wise” these ancient accounts are for us today and probably on into perpetuity. Of course, what may happen is that such wisdom will be “discovered” and portrayed as a new and innovative bit of research for moderns to adopt. It’s amusing to see modern corporations “discover” the brilliant merits of servant leadership, putting that forward as some recent innovation, leaving the at-least-minimally historically aware among us scratching our heads and thinking “really”? Are we really thatbiblically illiterate now? But wisdom remains wisdom and will benefit us all no matter where we imagine we got it. I’m glad at least some modern secularists have latched onto some values like not murdering others or objecting to any form of genocidal atrocity as an absolute value. Even if they are groping blindly in the dark, randomly grabbing onto such things … at least they have them —the question being: how long can they keep them when shorn of any real basis? We secularists would ask the same of you. The tragedy of it all is they do not keep them unless they can use them for some perceived advantage over others. I have not gone into post-modernity to any depth, but what I have seen of it so far has convinced me they ‘truly know not what they do and say’. Wisdom, as you say, is both universal and absolute – recognising it and differentiating it from foolishness however, can be a very difficult task, unless we seek a basis or a grounding in understanding the wise things so that we can tell them apart from the foolish. Your point is needed and taken, Lou (though, as usual, your continued reminders may be needed as I lean the other way in such zeal as I have). I also get sobering (for us Christians) reminders from this same preacher you also listened to once (and commended for his honesty as I remember). His latest sermon continues to address this point, even if you do just end up just using it for more ammunition for how Christians have recently given secularists good reasons for the challenge you give to us. Sorry about my botched link above … it’s ugly but it works. If you want to hear out his half hour (or so) sermon, just follow the link and click the video on the right underneath the sermon title: “Why?”. For summary he majors on our free will (part of the dominion granted to us by God), and what we do with that. Genocide in Rwanda is the major event discussed.